A tired baby is never a happy baby, and an unhappy baby means exhausted, sleep deprived parents! That’s why it’s important to find a good bassinet before he or she arrives. 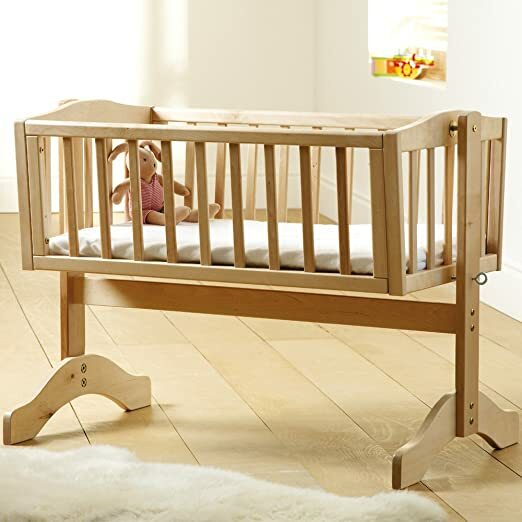 Bassinets and cradles are the bed that a baby sleeps in form birth up until around 6 months, before moving on to a full size cot. Bassinets and cradles take up a lot less space in order to fit in the parents’ bedroom, which is recommended in order to avoid Sudden Infant Death Syndrome (SIDS). Bassinets have fixed legs and no movement, they are generally oval in shape and often have a canopy cover, while cradles look like miniature cribs that rock back and forth. Both are great for moving from room to room due to their small size and lightweight, in order to keep an eye on your baby during naps. The rocking motion of a cradle is soothing for a baby, and a bassinet is enclosed and feels more secure, so clearly there are advantages to both bassinets and cradles, but it’s up to you to decide which one is best for you. Whichever you decide, there are certain things that you should consider before buying either. If your baby has already outgrow their bassinet or you’re decorating your unborn baby’s nursery and need a full size crib, then check our page about how to choose a crib for your darling baby. Which qualities should I look for when choosing a bassinet or cradle? Bassinet or co sleeper or cradle? A wide and sturdy base makes a cradle and bassinet safe, because it reduces the risk of toppling over. If the cradle has slats they shouldn’t be far apart so that the baby’s head doesn’t get stuck in between. The firm mattress for any newborn baby should have little or o room around the edge as this causes a risk of suffocation. Soft bedding should also be avoided because it increases the risk of SIDS, and any rocking or motions should be limited to prevent the baby from rolling against the side and suffocating. All this talk of suffocation may sound scary, but all of the products that I recommend are tried and tested by parents just like you, and have passed safety standard tests, but you should always verify this before purchase. You will only use a bassinet or cradle for a few months, so it’s probably not worth spending hundreds and hundreds of pounds on. That said, you might to find discount bassinets and cradles but if they’re too cheap the quality might be worse, so it’s important to find a balance. Don’t get me wrong – you can buy cheap baby bassinets that are great quality too! If you do choose to spend more, remember that it can be sold when you have finished with it, or given to a family member or friend, or saved for your future babies, so you can get your money’s worth or get some money back. A baby bassinet for the side of bed is called a co-sleeper, and they can fix onto your bed so that you are as close as possible to your baby, without the risks of bed sharing. Co-sleepers are ideal for C-section moms who can’t move much after surgery as they dont need to get up or out of bed in order to feed the baby, they can stay next to each other both day and night. If you are able to move around freely then the choice is yours; some parents prefer the practicality of a co-sleeper for night feeds, while others don’t mind getting up as in any case your baby is still only a few feet away from the parents bed. This co-sleeper crib by Chicco allows you to sleep rig ht next to your baby, without the danger of sharing a bed, makes night-time feeds a whole lot easier, and lets new parents sleep more easily, knowing that their little one is in sight, right next to them. The Next2Me bassinet can be adjusted to 6 heights and attaches easily to any kind of bed, but can also be used independently. It is suitable from birth up to around 6 months, and has a carry bag so can be used as a travel bassinet as well so that he doesn’t have to adapt to a new sleeping environment when he or she is away from home. The materials are removable and washable, and the mesh allows for easy breathing and vision. The bassinet is inclinable for babies with reflux or congestion. The base is wide and sturdy for maximum safety and has a simple, modern design. 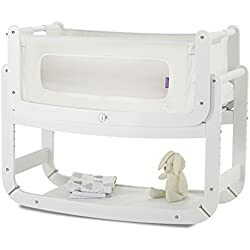 I think this is the best baby bedside sleeper on the market for it’s high quality and practicality for breast-feeding moms, to avoid getting out of bed for those late night feeds. Also ideal for C-section mommies who need to rest and heal. The Chicco Next2Me is a neutral baby bassinet which will look great in any nursery. This traditional style cradle in natural wood could be considered an old fashioned cradle with it’s simple swinging design. It’s called The Bethany Crib by Saplings. It has a simple design with classic slatted sides. 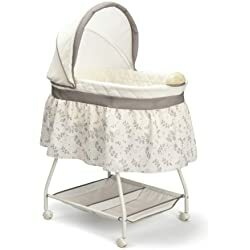 As a cradle, it has a swinging motion but can be used as a bassinet when the baby is less closely supervised by locking it in a stationary position using what they call “locking pegs”, which are actually just eye bolts. It is easy to assemble and can be used form birth up to around 6 months. Fittings and instructions are also provided, but the mattress is NOT, so you will have to buy one separately, but that allows you to buy a good quality mattress to suit your little one. 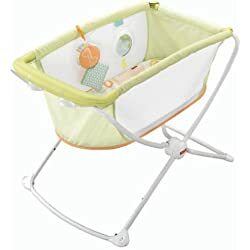 The Bethany Crib is a cute baby cradle, it’s simple and stylish and reasonably priced if you’re looking for a classic swinging cradle, that functions equally well as a stationary crib. The SnuzPod bedside crib is a 3 in one bassinet; it can be used as a bedside sleeper crib, a stand-alone bassinet or a floor level bassinet. Co-sleeping, as previously mentioned, is a safe alternative to bed sharing, and allows for easy late-night feeds and constant supervision of your newborn. The mesh sides are breathable and allow easy vision, and one side detaches easily to attach the crib to the parents’ bed. The height can be altered form 37 to 58cm to suit most beds. This bassinet is ideal for newborns and can be used up to 6 months old. The style is simple and modern in neutral wood and white. This cradle cot is a wooden rocking bassinet cradle, to be precise, meaning that the standalone bassinet rocks so that you can gently rock your baby to sleep, and you can lift off the bassinet to use downstairs or anywhere for daytime naps. There’s also a shelf for storage which is really handy during night-time feeds. The beech wood is low in volatile organic compounds and the mattress provided is chemical free. This portable bassinet by Fisher Price folds flat to carry it easily form room to room or to take away with you on holiday. With a gentle push it rocks, hence the name Rock ‘n Play, which is great to soothe a baby to sleep, and there is also a mirror and soft toy for playtime too. You can also put it into a stationary position if you don’t want it to rock. The breathable mesh sides allow easy vision for parents and better ventilation for baby. 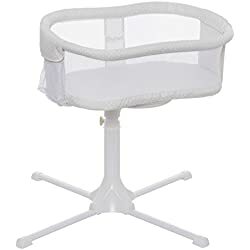 The soft pad that comes with this bassinet is removable and machine washable, but you may choose to buy an additional pad or small mattress. This Fisher Price portable cradle bassinet is ideal for newborns and can be used up to around 11kg. The Graco Dream Suite Bassinet is a reversible bassinet and changing table. There is the option of vibration in bassinet mode with 2 speeds. The mesh sides allow for good visibility and ventilation, and there is a canopy to block out light. The baby changer wipes clean easily and can be used up to 30lbs, meaning that when you have finished using the bassinet you can continue to use the changer. There is a storage basket for the baby essentials and wheels to move around the house with ease, which are lockable for extra safety. This bassinet allows you and your baby to stay close at all times, especially at nighttime during those few important first months, and takes up minimal space. The colors are again, very neutral, making it a great nursery bassinet, whatever the theme or color scheme. The HALO Swivel Sleeper bassinet is unique because it rotates 360 degrees! It allows you to sleep as close to your baby as possible, without the dangers of bed sharing. 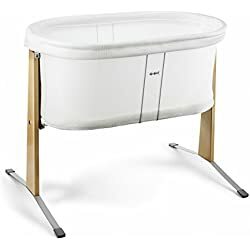 The side wall of the bassinet lowers so that yo can easily access your baby to tend to him or her from the comfort of your own bed, but locks into the upright positions for security. 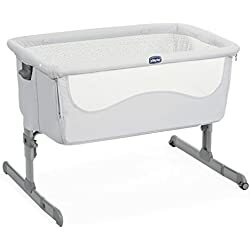 This bassinet is great for new moms who are recovering from a cesarean section or have limited mobility for other reasons, as you can rotate the bassinet to get in and out of bed gently and easily. Your baby is visible at eye level form your bed thanks to the mesh sides, which allow better breathing for your little one as well. The Swivel Sleeper includes a nightlight, 3 tunes with nature and calming sounds and 2 levels of vibrations, all to sooth and clam your baby. The sturdy base adjusts to fit the majority of beds, and can tucks underneath to take up very little space. Although it isn’t intended as a travel bassinet, this rotating co-sleeper could be considered a portable bassinet too, because many parents said they can easily remove the bassinet from the base and fold it easily in order to travel. Another neutral baby bassinet, this is the perfect baby girl bassinet or baby boy bassinet too, with different patterns available and even a pink version too.